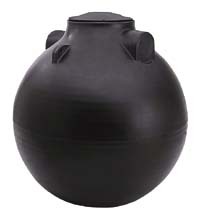 Designed to be used as a holding tank or pump tank, these tanks may remain in the ground when empty, but should not be installed in high water table or high clay areas. Furnished with manhole covers these tanks include a molded-in elevated pump stand on the bottom of each tank. * This tank is manufactured with both a flat inlet/outlet and a recessed inlet/outlet for shipping purposes. We ship at our discretion, an option is NOT available as to which tank you may receive.